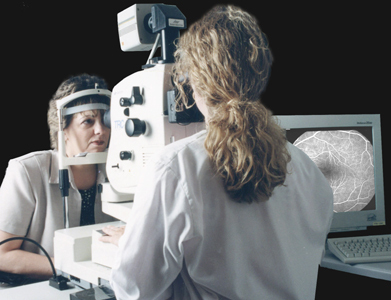 A fluorescein angiogram (FA) test is performed to help the doctor diagnose many retinal conditions. At the start of the test, dye will be injected into an arm vein. This dye will circulate throughout your body and eventually, through your eyes. The dye will make the blood vessels in your eyes standout under a special light. Over a period of about 10 minutes, the camera will take a series of pictures of your eyes. Your eye will be dilated for this test, which is done at all of our offices. When the dye is injected into your arm vein, you may feel a sensation of warmth throughout your body. However, this will only last for a few seconds. A small percentage of patients may have an allergic reaction to the dye. Severe reactions are rare, occurring in one in 50,000 people. If you have had a previous reaction to this dye, please let your doctor know. It will take at least one hour for the complete testing cycle. You will not be able to drive after the test due to your eyes being dilated. Therefore, you should make arrangements for someone to take you to our office. Your eyes will remain dilated for about four to six (4-6) hours following the test, and you will be able to resume your normal activities thereafter. You may also notice that your urine will appear yellow for about 36 hours following the test. This is normal and you should not be alarmed by the bright yellow color. 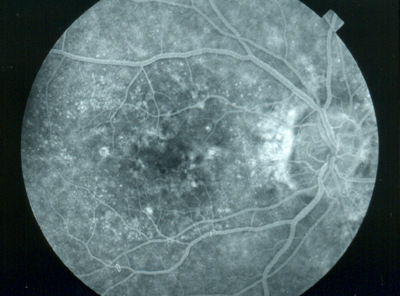 Unlike other types of angiograms, the FA and Indocyanine Green Angiogram use special fundus cameras and not x-rays. Therefore, you will not be exposed to any radiation during the testing.